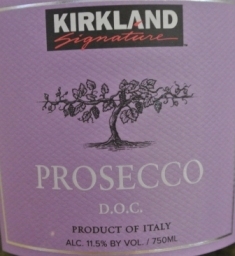 I’ve seen a few of our Twitter followers post photos of the Kirkland Signature Prosecco so I was looking forward to giving it a shot. And I’m glad I did. At $7.49 this is a Prosecco bargain, tasting just like other Proseccos I’ve enjoyed that cost twice as much in some cases. After the fizz settles in the glass, you get aromas of apple and pear. On the palate, the wine becomes a little more citrusy, subtle flavors, simple and easy, with a light body and a dry mouthfeel toward the finish. There’s nothing funky anywhere on this wine, which makes me question if you need to spend much more on Proseccos, or other sparkling wines for normal drinking. This bottle is a fraction of the cost of most bottles of Champagne, and for casual get togethers, it will get the job done just fine. It is the perfect aperitif for a party or dinner gathering which is exactly how we enjoyed it.